Wednesdays, never forget, you need to be in the pool to ensure an early finish. From 9:00 the Blue School arrive and take up three of the six lanes, as well as the training and lagoon pools. With two more lanes being combined for general swim this leaves only one lane for those of us keen to do lengths. I foot this, arriving in the water at quarter to nine. 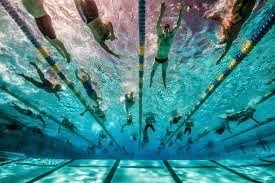 The lane was empty for my first four lengths, sixty to go, when I was joined by an nice old fellow who swims breast stroke like me, a fraction quicker he is, and then alternates with back stroke - he has a bad neck he once explained - when I catch up and a little more. We share a lane well, efficiently. I was in the early twenties when the children and their high pitched frivolity joined the fray. Into 'our' lane came an Asian lady who's quite fast going forwards, but on her back, very slow. Lane swimming is all about the slowest swimmer, tricky. As the attendants combined the other two lanes another lady joined us too and the sensible maximum of three per lane was over. As it was, after a couple of lanes we'd all sorted out our rhythms and were working well as a small community. I felt proud in the human ability to all get along. Until, the testosterone macho-man dived in. He had as much right as the rest of us of course, I would never deprive him of that freedom. He proceeded to impress with his pacey front crawl, probably twice the speed of any of the rest of us. And those fancy forward-roll turns too. Not being able to swim past us with the frequency required he opted for turning before a lane end, quite a good solution, until he was suddenly spinning as we all limited the middle ground. Time for a blistering strike through the crowd he decided. Gulping the water, not my favourite pastime, damn. None of us where going to submit. I wonder what the attendants made of it all, and what my comrades were thinking too. The Asian lady decided to relax on her back more often. I lost count of my lengths, or did I? The microcosm of the world had fallen apart. My relaxing swim, when I sort out my brain, calming gently into the day, became a whirl of frustration, misunderstanding, doubt, conflict. Somehow, I managed to reach fifty lengths before giving up. That five individuals, all keen to swim, weren't able to do so with an amount of consideration, cooperation and thought. Is it any wonder we have a world we have?